After a youth filled with music and experimenting with equipment, including dismantling the drivers from speaker cabinets and reassembling them into new enclosures, then a university career filled with further audio experimentation including a collaboration with an engineering student friend, in 1984, Thomas Gessler started a job in a consultancy for new technologies. The position consisted of alerting interested companies to inchoate technologies and then supporting their implementation. His major projects dealt with surface-mount technology (at that time an entirely new way of attaching components to electronic circuit boards), and artificial intelligence, which had already emerged as a significant subject. Thomas seemed to possess a natural talent for calculating the potential benefits of these emerging technologies, and by 1990 he was offered a job as managing director of a company that had been established at the Ruhr University Bochum for developing research results into marketable products. At that time, the University’s electronics department was working on sensors, measurement electronics, and applications for some of the very first signal processors based on thin- and thick-film technologies. Because the signals from these sensors were so weak, there was a need for an entirely new breed of measurement electronics: highly reliable, high-resolution analog amplifiers. Having access to the capabilities of the Ruhr University and teeming with new ideas and concepts in analog amplification (as well as in digital signal processing), Thomas and his young team were also all music lovers. That is when the inevitable happened: They decided to develop their own audio electronics, spurring Thomas’ acquisition of the staff of the University’s electronics department. Over the next two years, 1991 and 1992, several key things occurred. Thomas’ team created its first real audio product, developed as much as a proof-of-concept for what it could do with signal processors as anything else, called the DLC, or Digital Loudspeaker Controller. The DLC could actively correct the phase and frequency shortcomings of a loudspeaker. Sadly, it was a total commercial flop. Though many experts were excited, customers showed absolutely no interest. It was some 15 years ahead of its time. About that same time, Gessler received an invitation to an open competition to the industry to develop the external active four-way crossover for the new B&W flagship loudspeaker project, the Nautilus. Not only did Thomas’ group win that contest, but it continued producing those crossovers until about 2014. The successful contract from Bowers & Wilkins seemed to be the final impetus, and on January 1st, 1994, Thomas founded Audionet. One of its very first products was for the medical world—a measurement unit for a sensor that could be used to gauge the oxygen content of blood. Audionet also developed the very first rain sensors for the automotive industry, along with the required measurement technology to integrate them. 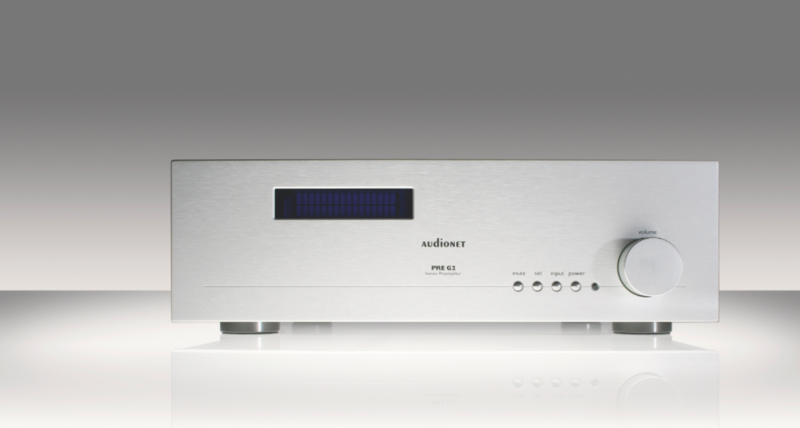 These were followed shortly by the first Audionet amplifier, called The End, in 1995, initially delivered to the Taiwanese market, then introduced to Germany and Europe in 1996. The game, as Sherlock Holmes would say, was afoot. Fast-forward to October, 2014, which saw momentous change at Audionet. Thomas rounded out the Audionet “Dream Team” by adding Robert Hagemann (formerly with Dynaudio, KEF, and Burmester) as a managing partner, bringing in Jan Geschke (Mercedes-Benz, Porsche, Dali, and Dynaudio) as the brand director, and contracting renowned industrial designer Hartmut Esslinger (Apple, Sony). While Audionet may be an unfamiliar name in the U.S., my visit to Munich to attend the High End Show this past May showed me that the company enjoys a status in the German and European audio market comparable to that which companies such as Constellation or Pass Labs enjoy in the United States. You simply could not miss Audionet’s presence throughout the Munich High End event and the MOC Halls, with wall-sized banners, elevator door, floor, and stair applications, wall hangings, and signage seemingly everywhere. The first time I heard the name Audionet was a mention by longtime friend and colleague, Dr. David Robinson, in his 2014 Rocky Mountain Audio Fest report. The first time I recall hearing the products came the following April, at AXPONA 2015, which saw my first show report for The Absolute Sound. Since then, I’ve heard this exceptional gear at many shows, where it has never failed to earn my respect. But it was last September’s private launch of the YG Acoustics Sonja XV event, using the very devices under evaluation here, that solidified my desire to take this closer listen.